The rhesus, or Rh, factor is a protein that is present on the surface of most people’s red blood cells. According to the Nemours Foundation, about 85 percent of people are Rh positive. The Rh negative diet is largely the product of work by Dr. Laura Power, creator of the Biotype Diets. According to Dr. Power, Rh negative blood, the red blood cells of which are without the Rh factor, developed only among the isolated communities of the French and Spanish Pyrenees and have the highest propensity for food allergies, necessitating a special diet. The Rh negative diet is based on the other major classification of your blood, O, A or B. Dr. Power’s Biotype Diets are designed primarily for these more common blood types. If you choose to develop your diet around your blood type, you should begin by focusing on your ABO blood type. In addition to the Biotype Diets, you might also refer to the D’Adamo Institute’s blood type diets. According to Dr. Power, the evolution of the Rh negative blood in Western Europe explains why the blood type fares best with Western European foods. Within the directives of the ABO blood type diet, Rh negative individuals should eat a variety of meats, poultry, seafood, European fruits and vegetables, roots, tubers and seeds. But, in addition to the limitations imposed by the ABO blood type, Rh negative individuals should also avoid certain foods in these categories to which they may be allergic or hypersensitive. In a study published in a 2007 issue of the "Journal of Nutritional and Environmental Medicine," Dr. Power described the results of her experiments on allergic responses to foods based on blood type. According to the article, the results did in fact show responses patterned according to blood type, vindicating the blood type diet approach. Rh negative blood reacted most severely with eggs, milk, cheese, nuts, beans and gluten. It was also consistently among the top producers of immunoglobulin E (IgE). Dr. Powers' findings regarding IgE reflect the fact that individuals with Rh negative blood are more likely to have true food allergies. 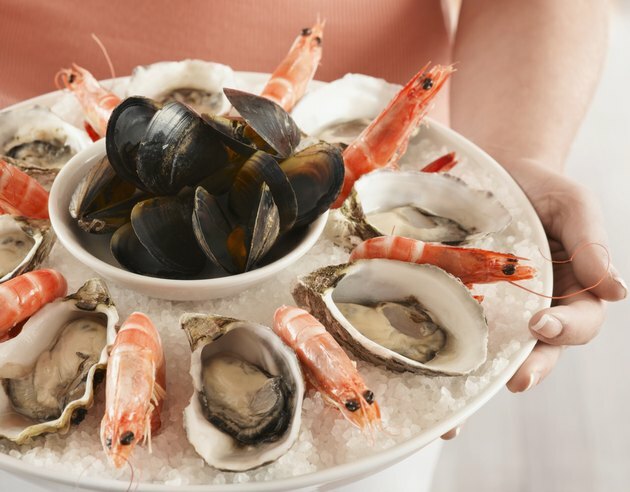 According to Medline Plus, true food allergies, in which the body produces an immune response against molecules in certain foods, are relatively rare--they affect less than 1 percent of the American population. The production of IgE antibodies in particular are responsible for primary food allergy symptoms. Rh negative blood types had the most severe response to peanuts, suggesting a propensity for peanut allergy. Rh factor negative is also hypersensitive to beans. In addition to ABO blood types, you may be interested in learning more about your genotype. Dr. Peter D'Adamo, a pioneer in blood type diets, also developed a parallel diet system based on genetic type rather than blood type. According to Dr. Tom Greenfield, a UK physician using the D'Adamo approaches to diet, Rh negative individuals should make specific adjustments to their ABO diet, and might have entirely different diets based on their genotype. Greenfield quotes D'Adamo as recommending fewer grains for all Rh negative individuals, fewer fruits for A negative and more protein for B and O negative individuals. Is Coconut Oil Good for Blood Type O?